Stripped-Down, Bootable Linux OS for Visual Performance, Installation? pure:dyne is a new free, open source, Linux-based, bootable, low-latency, high-performance operating system with Pure Data (Pd) as its main emphasis. Pop a CD, USB key, or bootable hard drive into your PC or Intel Mac, and you’re ready to go. Now, needless to say, a big appeal of this isn’t just tuning the OS to your needs — it’s taking performance gigs wherever you go, ready to go, without having to worry about OS crashes. It’s installing a pre-built installation on a home-built Linux computer or Mac mini. It’s having a backup when your machine dies. pure:dyne is completely tuned for Pd, the open-source cousin of Max/MSP. (Pd was created by Max’s creator, Miller Puckette, and Max and Pd have shared code and exchanged ideas since the very beginning.) Pd comes with an awesome lineup of Pd extras: PDP, PiDiP, Gem, GridFlow, RRadical, PixelTango — all the additional libraries that normally take some time and dependency-managing to install (and some of which just don’t work or don’t work as well on Windows or even Mac). So, if you’re ready for some free patching of custom visuals, you’re already happy. But this got me thinking. 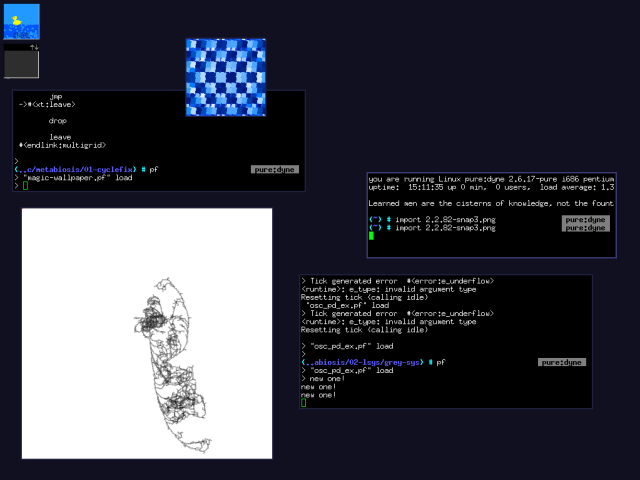 Processing runs under Linux, and one challenge is often tuning a distro with the right drivers and settings (think webcam support, for one) and different Java versions. It’d be a no-brainer, if Processing is to be as successful as it could be, to tie it to a perfectly-tweaked, bootable distro. Flash, now with the robust Flash Player 9 for Linux, which also promises video4linux webcam support for live input, could do the same. (In fact, for my own purposes, a custom Pd+Flash+Processing distro would be heaven for live visualist work.) And that’s just the beginning. This also makes a nice bridge between commercial software (the comfort of Adobe Creative Suite for assembling visuals, for instance) and free software (a perfectly-tuned, custom performance and installation environment).